Welcome to the official 3DS Homebrew Launcher website ! This page is meant to be a hub between all the best and newest ways to get homebrew running on your system. If you want to see homebrew in action, check out this video ! 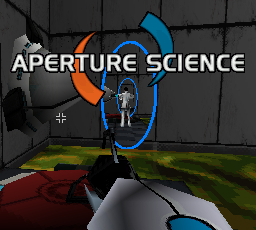 Play Aperture Science 3D, a free adaptation of Portal for the 3DS. Play out-of-region games you own. Make your own themes to use in home menu. Play old SNES games with blargSNES. How do I get homebrew running on my console ? NOTE : unfortunately this entrypoint was patched in update 11.4. It still works on 11.3 and below. You can now access homebrew through the 3DS's stock sound application! All you need to do is grab the right sound file over at nedwill's soundhax website, and place it at the root of your SD card along with the right otherapp payload. You can grab the right otherapp payload for your console below on this page. Don't forget to rename it to otherapp.bin and place it at the root of your SD card! If you own a copy of Cubic Ninja (and don't plan on selling it for massive profits), please head over to the ninjhax website and follow instructions there. If you own a copy of Freakyforms Deluxe, please head over to plutoo's freakyhax website and follow instructions there. If you own a copy of The Legend of Zelda : Ocarina of Time, you can install oot3dhax. This can either be done by first using another hax method to run the oot3dhax installer, or by directly writing a raw savegame image to your gamecard. For the former option, you can find the installer in the homebrew starter kit. For the latter, you can find more information on yellows8's repository. If you've downloaded the free Steel Diver : Sub Wars eshop game, you can use it as a homebrew entrypoint. Just head over to vegaroxas's steelhax webpage and follow the instructions in the archive's readme file! You will need to download the right otherapp payload for your console, which you can grab below on this page. If you own a copy of Paper Mario : Sticker Star, please head over to yellows8's stickerhax website and follow instructions there. If you own a copy of Pokémon Omega Ruby (yay) or Alpha Sapphire (boo), please head over to mrnbayoh's basehaxx website and follow instructions there. If you own a copy of Pokémon Super Mystery Dungeon, you can install ShinyQuagsire's supermysterychunkhax. Currently, initial installation for this can only be done if you or one of your friends already has access to homebrew. To get supermysterychunkhax, you can follow the instructions from its official webpage. If you own a copy of VVVVVV, please head over to shinyquagsire's (v*)hax website and follow instructions there. If you own a copy of Citizens of Earth, please head over to Dazzozo's humblehax website and follow instructions there. If you own Super Smash Bros, a New 3DS, some compatible wifi hardware and aren't afraid of going under the hood, then you can head over to yellows8's smashbroshax webpage and follow instructions there. Do note that this is currently the least convenient method of running homebrew, and will likely be best suited to installing a more permanent setup such as ironhax (see above). If you own a copy of Smile Basic, please head over to either mrnbayoh's basicsploit website (currently supports only USA) or plutoo's smilehax website (supports JPN and USA) and follow instructions there. NOTE : unfortunately the latest version of Ironfall can no longer run ironhax. Only those who downloaded Ironfall before September 2015 will be able to run ironhax. NOTE : it is currently possible to download the original (still vulnerable) version of Ironfall by using homebrew. To do this, simply install browserhax (see above), and use it to download the old version of IronFall by starting the "eShop - old version downloader" application in homebrew menu and downloading IronFall like your normally would. Be quick, this won't last long ! Much like tubehax, ironhax requires that your console be on a firmware version between 9.0 and 10.3, and that you have IronFall (previously available for free on the eShop) installed on it. Unlike tubehax and ninjhax however, IronFall is not "self-sufficient" : you will need either tubehax or ninjhax to perform the initial ironhax install. The advantage of ironhax is that unlike tubehax, it only requires an internet connection the first time; after that, you'll be free to use it untethered ! First go down to the "preparing your SD card" section and follow those steps, then come back. Don't worry, we'll wait for you ! NOTE : the following steps might be slightly confusing to some people. If you find you're not sure what the steps are referring to, please just head over to the Youtube video showing them being executed here. Run IronFall at least once before continuing. No need to play it (though it certainly doesn't hurt ! ), but you have to run it at least up to the main menu. Setup an initial way to run homebrew on your system, such as tubehax or ninjhax. If you installed ninjhax a while ago, please uninstall it and reinstall it ! Your version might be outdated; installing ironhax requires ninjhax 2.1 or more recent. Download the ironhax installer. If you downloaded the Homebrew Starter Kit below, you should already have it ! Run the ironhax installer and follow the instructions on screen. Make sure your 3DS is connected to the internet for the install ! Reboot your 3DS and open IronFall. Select the save slot that says "ironhax" and press A. The Homebrew Launcher will start ! If your 3DS is on a compatible version, you can use the stock web browser to get homebrew running ! Head over to yellows8's browserhax page and follow instructions there. Note that browserhax does not currently support the latest firmware versions. If your 3DS is on a compatible version, you can use home menu itself (!) as a permanent entrypoint to get homebrew running ! Head over to yellows8's homemenuhax page and follow instructions there. Note that menuhax only works on firmware versions between 9.0 and 11.2. NOTE : unfortunately Nintendo has patched tubehax and made it impossible to use the YouTube application without updating. tubehax is dead, long live browserhax. In order to install tubehax, you will need a console whose firmware version is between 9.0 and 10.1, as well as the YouTube application (available for free on eShop) and an internet connection. On your 3DS, open the System Settings app, then go to Internet Settings and Connection Settings. From there, select your favorite Connection, tap the Change Settings button, and on the second page head over to the DNS section. Once there, select "No" for "Auto-obtain DNS", and under Detailed Setup, enter the following address : 107.211.140.065. Save these new settings and close the System Settings app. Open the YouTube app. It should redirect you to a firmware selection page. Under "Select your firmware version", choose your console's firmware version. Getting this right is very important ! Once you're sure you did it right, hit the Submit button. Wait for a few seconds. If you did all the previous steps right, the exploit should run and the Homebrew Launcher should load up ! The source code for tubehax can be found on github. > Where can I find more homebrew applications ? You can visit 3dbrew for more homebrew applications. > Can I use this to take screenshots ? Yes. You can take screenshots in either homebrew or commercial games by hitting the HOME button. You can then convert them to PNG by using the screenshot tool included in the starter pack. In order to take screenshots of official games, you will need to run them through HANS. > I set up tubehax and I can no longer access the eShop. What's going on ? tubehax works by redirecting your DNS requests to a server that will make your console think that youtube.com is another server. In addition to this, our DNS server blocks requests to Nintendo's eShop and update servers by default, meaning that as long as you have the tubehax DNS set up, you will not be able to access the eShop or update your console. You can restore access to the eShop (temporarily or permanently) by switching the DNS back to its original settings. If there is enough demand, we may consider setting up another DNS server for tubehax which does not block traffic to Nintendo's servers. > Can ironhax be uninstalled ? Yes. Simply select the ironhax savegame slot in the IronFall main menu, and delete it ! > Can tubehax be uninstalled ? Yes. tubehax is never actually installed to your system; all you need to do to disable it is reset the DNS in your internet connection settings to what it originally was. > What are 3DSX files ? Why doesn't the homebrew launcher load CXIs ? We made the decision early on that the homebrew launcher should only work with a highly relocatable executable format as a way to improve compatibility with potential future exploits (such as ironhax and tubehax), which may or may not include the ability to update virtual memory page permissions. 3DSX is a format developed by fincs which allows us to do just that; each section (.text, rodata and data) can be relocated independently, making it perfect for our needs. Compiling as 3DSX rather than CXI will help maximize future compatibility. > Does this allow region free ? It totally does and it's pretty rad. You can access the region free feature directly from the Homebrew Launcher; it's the first option in the list, can't miss it. For more information on the region free feature, please visit regionFOUR's README page, as the exact same limitations currently apply. > Does this let me run roms ? No. These exploits run strictly in userland, meaning that we do not have full control over the console, and therefore cannot run pirated software. That being said, we have the same amount of access as regular apps and games to the console's hardware, and so we can make some kickass homebrew! We'd all also like to thank everyone who has been contributing to the 3DS scene in one way or another, including (but not limited to) : yuriks, Subv, sm, StapleButter, bunnei, WinterMute, neobrain, and, like, so many other people.